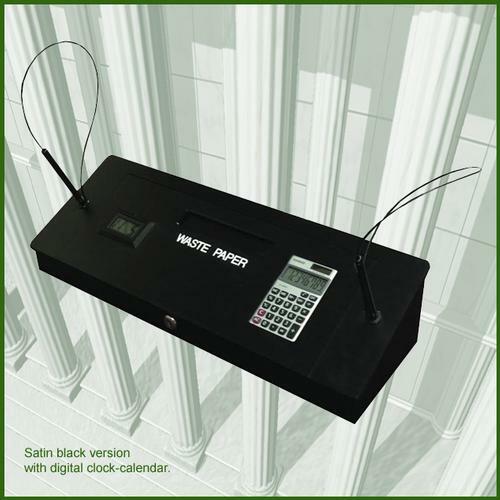 This stylish and functional single-sided check stand center piece unit includes two security pens on cables, a calculator, a waste depost slot and a digital clock-calendar or a magnetic perpetual calendar. Available in three beautiful 1/4" anodized aluminum finishes: satin clear, satin black or satin brass. Waste placed in the receptacle is secure until unit top is unlocked for waste removal. Optional FDIC or NCUA logos may be added. Dimensions: 8" D x 22" L.
This stylish and functional single-sided check stand center piece unit has two pens on cables, a calculator and digital clock-calendar or magnetic perpetual calendar. Available in three finished: satin clear, satin black or satin brass.